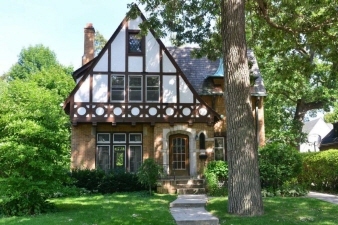 Bring your ideas to this home once built for son of Milwaukee's Beer Barons. Lovely Tudor located on one of Whitefish Bays most beautiful streets near the Shorewood border. The character in this home is endless, enhanced by the natural fireplaces, crown molding, leaded windows with stained glass, ornate columns, custom woodwork, copper gutters and classic slate roof. This home is full of potential and perfect for the buyer with an eye for design.